A state of emergency was declared in Ventura County Tuesday for a wind-driven brush fire that broke out north of Santa Paula Monday evening, prompting thousands of evacuations and destroyed dozens of structures. The fire, dubbed the Thomas Fire, exploded to 50,500 acres — over 70 square miles — overnight, according to Ventura County fire officials. During a morning news conference, they said the fire is 0 percent contained. Later in the day, Ventura County officials said they were still looking through the burned areas to assess the damage. Fire officials said the blaze was continuing to be swept in a westerly direction toward the ocean. About 500 firefighters from several agencies are actively fighting the fire, according to Ventura County’s emergency information website. 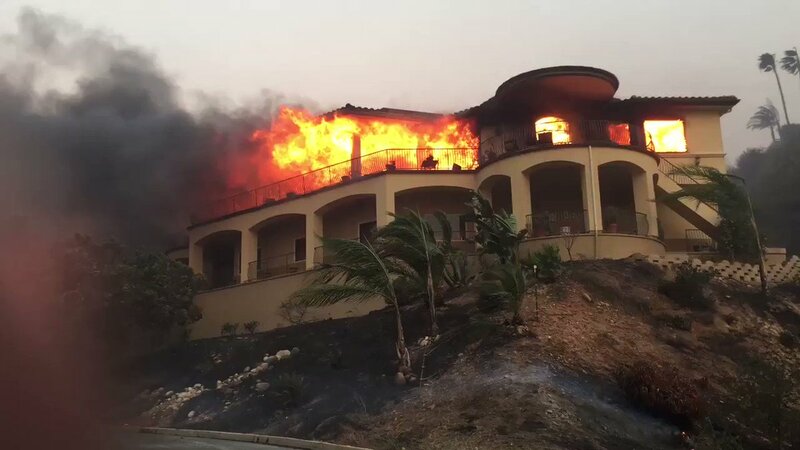 One Ventura homeowner named Cindy told KTLA her family evacuated the night of the fire within just 30 minutes, first hearing about evacuations at about 10:30 p.m. and leaving by 11 to stay overnight at a friend's business down the road. "We came back and we could see the hillside here is still lighting on fire," she said. She told the fire department and they came down and tried hosing down the remaining flames. But she said "embers keeping popping" in the shrubbery nearby. "We're afraid it might catch the house on fire," she said. About 3,000 residences remained threatened, fire officials said during a late afternoon news conference. "I just want it to be over," Cindy said. "Our neighbors are all gone so it's upsetting." Residents in Santa Paula east of Dickenson Road, north of Monte Vista Drive along Highway 150 and South of Thomas Aquinas College to the area of Say Road. Residents in Santa Paula west of Dickenson Road to Atmore Road, north of Foothill Road and west to Wheeler Canyon Road. Residents in Upper Ojai north of Highway 150 from Koenigstein Road west to the Dennison Grade, north to Reeves Road, east to McAndrew Road and north to Grand Avenue. Residents in Santa Paula and Ventura north of Foothill Road west to Wheeler Canyon Road, north to Canada Larga Road and east to Barlow Canyon Road. Residents in Ventura, CA south of Highway 33, east of Main St, north of Foothill Road and Hall Canyon Road and west of Canada Larga Road. Voluntary evacuations for residents in Fillmore north of 2nd Street, east of Island View, north of 4th Street, north of Wood Grove, north of Country Court and east of "A" Street. Evacuation shelters are open at the Ventura County Fairgrounds at Miners Building. The shelter is also available for all types of animals and is located at 10 West Harbor Avenue in Ventura. A second shelter is also open at Nordhoff High School at 1401 Maricopa Highway in Ojai.